This is "Lassiah", a 3 year old male "Bluffons" macaw. Lassiahs mother is a Buffon's Macaw and his father is a Blue & Gold Macaw! 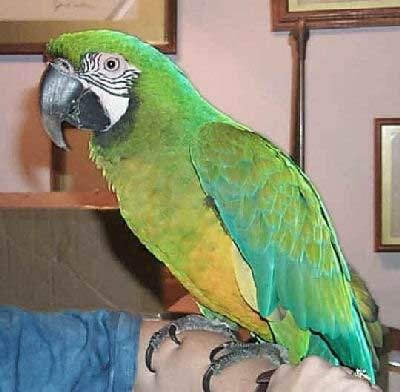 The Bluffon's Macaw is a hybrid cross between a Blue and Gold Macaw and a Buffon's Macaw. It is a first generation macaw, meaning its parents are two species of naturally occurring macaws.The Blue and Gold Macaw has been has been one of the most popular pet birds in the trade. The Buffon's Macaw, highly endangered in its native habitat, has been quite scarce. But it has done very well in captivity. It is a ready breeder and is becoming more firmly established today. Some Buffon's Macaws have even been re-introduced into their native habitat. Hybrid macaws are bred for color. Because they are a mixture of more than one type of macaw, the offspring are influenced by the traits and characteristics of both of its parents. Father's have the dominant gene, so this will generally influence the offspring's coloration and overall appearance. The temperament and behavior of hybrids are areas of uncertainty and are unpredictable. But having parents are that are both quite docile and affectionate macaws, the Bluffon's Macaw will be a real beauty and should be a good natured pet bird. All macaws require good socialization and consistent training to make good pets. The Bluffon's have the gentle nature and the speaking ability of their parentage and they can be a very affectionate, inquisitive, and fun pets. Scientific Name: The Bluffon's Macaw is a first generation hybrid, a cross between: Blue and Gold Macaw Ara ararauna and Buffon's Macaw Ara ambigua. This macaw is also known as the Buffgold Macaw in some countries. Description: Bluffon's Macaws are a pretty pastel hybrid. Both parents of the Bluffon's Macaw contribute to the delicately blended colors of their offspring, though the father's have the dominant gene and this will influence their final appearance. With its one parent being a Buffon's Macaw, that gives it a lot of gorgeous green. And when the blues and golds of the other are mixed in, pastel shades of blue-greens underscored with yellow golds are possible. Bluffon's are a full size Macaw and can learn to talk with a general vocabulary of about 15 or more words and expressions. Size - Weight: A full sized macaw, they can get over 2 lbs. Lengths up to 86 cm (34 inches). Care and feeding: A roomy cage is required unless the bird is to be let out for extended periods. Many birds can spend most of their time on a play pen or parrot perch. They eat a variety of seeds, nuts, fruits, and commercial pellets, as well as the same nutritional foods humans eat. See About Macaws: Housing and About Macaws: Care and Feeding for more information. Social Behaviors: It is generally believed that hybrid macaws get the best attributes of the parents. In this case, the Blue & Gold Macaw makes a good family type bird, while the Buffon's Macaw is extremely good natured and gentle. I have four 2 years old macaws and i'm ready to sell three of them due to my time schedule. Anyone interested can get back to me via my email at roberttaylor087@gmail.com for more details and real and clear pics. This is george again. Over 2 years later and paco has come a long way. He is an outgoing lovable goober who adores my wife, and if she isn't around likes me. God forbid I get near her or him though, if they are together, he will rip me apart. But for the most part he is a great bird. Definitely not for the first time bird owner, like others have commented. It took us 2 years too get him handable and trustworthy, and yes he is very strong. This is so great! I have a Bluffon, but never knew what type of macaw he is until now. People have told me several times that mine was probably a mix between a military and blue and gold, and I thought they were right because of the very few red feathers on the bridge of his nose, but then I see this beautiful bird above and I swear it is just like looking at my bird. Thank you for posting the picture.